Landscape Infiltration devices have become a favored method of controlling and filtering sediment and pollution carried by rainwater runoff, replacing large sediment ponds previously used. 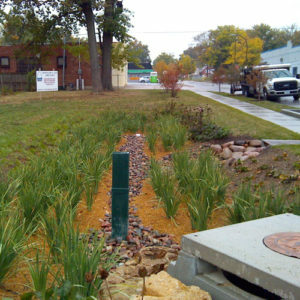 Landscape infiltration devices utilize beds of sand, gravel and mulch, along with native plantings to filter the runoff before the water enters the stormwater system. When completed, the area appears to be a nicely landscaped section of the property.